The Jasper Whistlers Inn hotel is the most centrally situated Jasper hotel out of all our featured Jasper ski accommodations. Centrally located in the heart of Jasper National Park townsite, the Jasper Whistlers Inn is within walking distance of all shops, services and outdoor mountain activities. The Whistlers Inn boasts a cozy Canadian Rockies alpine atmosphere and features 63 spacious guest rooms for accommodation, many with breathtaking views of the surrounding mountain ranges. The friendly and knowledgeable staff at the Whistlers Inn really make the Jasper Whistlers Inn a pleasant place to stay and make your Jasper Ski Holiday memorable. 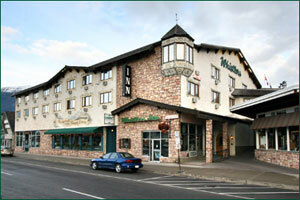 Contact us for more information or to include this Jasper hotel as part of your Jasper Ski Holiday package. This Jasper hotel is eligible for additional Jasper Ski Holiday package discounts. Contact us for details.